The Pantone Color Institute has officially announced their 2019 color of the year, and we are living for it. Yesterday, the self-proclaimed authority on all things color announced Living Coral – the bright, vibrant hue – would take over from the 2018 Ultra Violet color of the year. Living Coral, Pantone says, is “an animating and life-affirming coral hue with a golden undertone that energizes and enlivens with a softer edge. We personally love a coral hue. It’s fun, energetic and it’s just difficult to be depressed around this color. 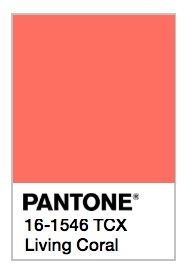 “Living Coral embraces us with warmth and nourishment to provide comfort and buoyancy in our continually shifting environment,” said the Pantone announcement. After the crazy ride 2018 has been, we think this color is a joyful note upon which to start 2019. Pantone’s pick for color of the year affects a lot of aspects of our lives from fashion to home decor, whether we realize it or not. Pink hues don’t work for everyone. (Kelly here: I’m a good example. My skin has red undertones.) But the different ways a hue like coral can be used are endless. For fashion, pops of coral work for everyone, no matter your undertones. For weddings, spring and summer weddings incorporating the color in floral arrangements and table decor will be a bright spot during the spring and summer wedding season. Even using the color for bridesmaid’s dresses — though historically it has been made fun of — we think this Living Coral is a beautiful interpretation. What do you think about the 2019 color of the year? Will you incorporate Living Coral into your Big Day?